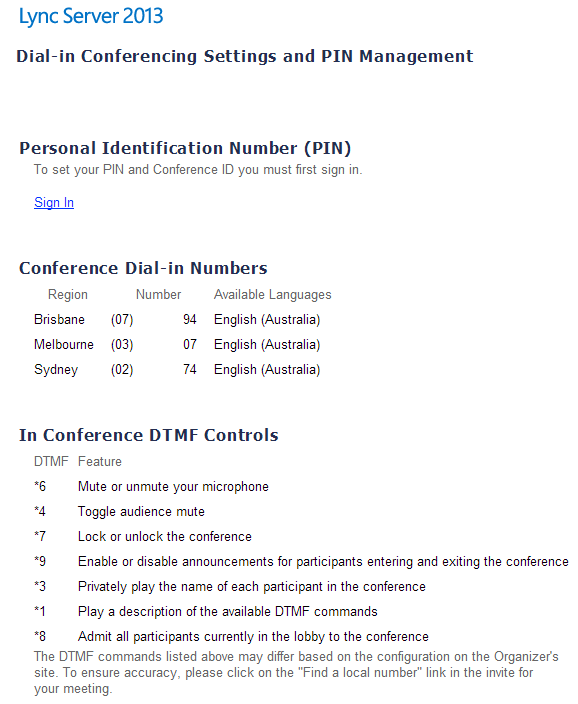 By default, the Lync 2013 dialin page, e.g. https://dialin.contoso.com, looks pretty awful. Text is rendered in default web types, and the table of available numbers is almost unreadable as all the columns are pushed together. I’ve seen other posts on repairing this issue by hacking the inline CSS to include some spacing for tables and horizontal lines, but there’s an easier way. Double check to see if the PSTN_info_styles. *.css files are in C:\Program Files\Microsoft Lync Server 2013\Web Components\Dialin Page\Ext\client – if they’re not there, copy them (or at least the one for your language) from the App_LocalResources folder and paste them in the client folder. While it’s not a huge improvement, at least the sans-serif fonts will make things a little easier on the eye, and stop your dialin page from looking like it’s from the 90s. You also would have to copy the css files up one level to make that work (that step isn’t listed above). I changed mine to just point at dialin/client/PSTN_info_styles.css and copied the en-US file up one level to that name. This is actually the way the 2010 dialin page appears to work.